Crown Prince Mohammed bin Salman continued his active visit to the United States yesterday, attending a business meeting in New York with over 200 executives, and separately meeting with the Secretary General of the United Nations, Antonio Guterres. 200 top business leaders from the U.S. and Saudi Arabia – including two dozen women – assembled in Gotham Hall for an exclusive meeting at which several of Saudi Arabia’s top ministers and other high-level officials spoke. According to a release from the Saudi embassy in Washington, D.C., 36 MOUs were signed with over $20 billion in new deals. The deals include an Aramco-Google partnership focused on national cloud services and other technology opportunities, a five year-content-led initiative between ITHRA and National Geographic, a partnership between Aramco and Raytheon to establish national cyber security services, a MOU between SIDF and JP Morgan to explore collaboration in industrial financing in the Kingdom, and a partnership between Alrushaid and International SOS to provide medical services in the Kingdom with a focus on remote area clinics. 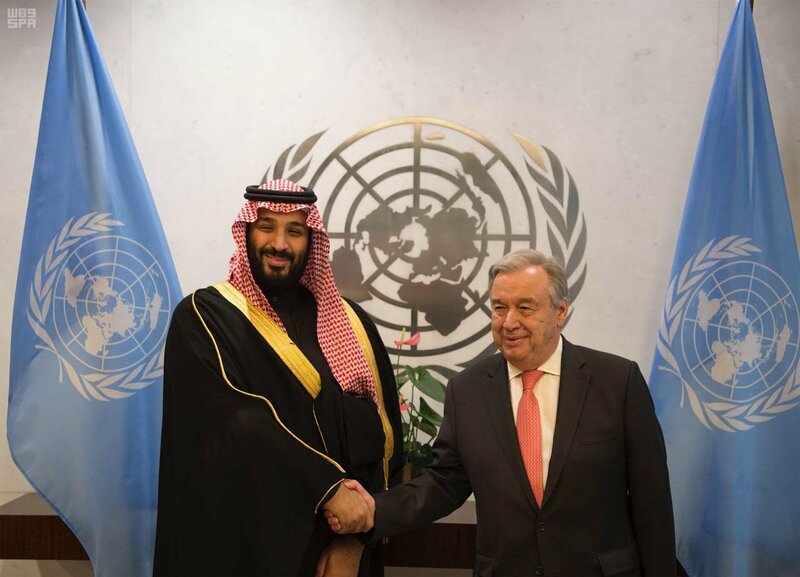 The Crown Prince and the Secretary General also attended the signing of the joint executive program between the Kingdom of Saudi Arabia and the United Nations, represented by the United Nations Office for the Coordination of Humanitarian Affairs, to support and finance the United Nations Humanitarian Response Plan in Yemen for the year 2018. The agreement includes $1 billion from the Kingdom and the United Arab Emirates, including $930 million to United Nations organizations and $70 million to rehabilitate ports and roads to increase the volume of relief items and commercial imports.